The Faces Of Forced Arbitration shares the stories of workers who have had to overcome the barrier of forced arbitration to access the public civil justice system. “Workers Beware” is intended to provide information about employers that impose forced arbitration on their employees for the benefit of advocates, researchers, policymakers, and—most of all—workers. 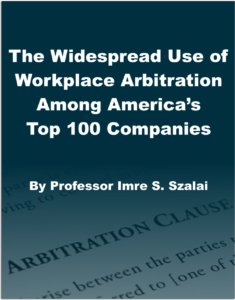 Taking “Forced” Out Of Arbitration is a simple and effective tool to educate others about the necessity of ending forced arbitration, a pervasive and insidious business practice which deprives millions of workers access to the courts when their employers violate our nation’s employment and civil rights laws. The Employee Rights Briefing is a monthly newsletter designed to help keep you up-to-date on breaking news and emerging trends impacting America’s workers. Resources for those who seek information about the recent executive orders on immigration, have employment-specific questions regarding the rights of immigrants and refugees, or need a referral for additional immigration or refugee legal assistance. The Employee Rights Advocacy Institute For Law & Policy (The Institute) is pleased to announce the publication of our 2017 Annual Report. 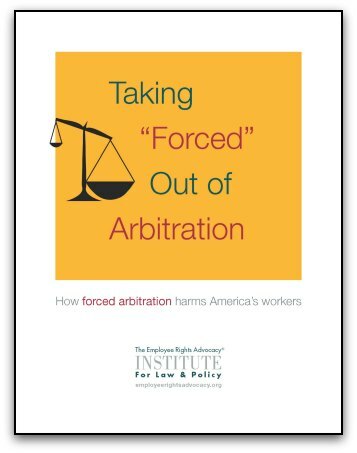 At least 52 of America’s Fortune 100 companies, which collectively employ over 10 million workers, use forced arbitration to deny workers the opportunity to enforce their civil and workplace rights in court.